Cassata: Cassata or Cassata siciliana is a traditional sweet from the area of Palermo, Sicily, Italy. 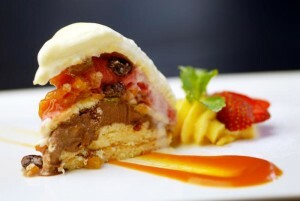 Cassata may also refer to a Neapolitan ice cream containing candied or dried fruit and nuts. Cassata consists of round sponge cake moistened with fruit juices or liqueur and layered with ricotta cheese, candied peel, and a chocolate or vanilla filling similar to cannoli cream. It is covered with a shell of marzipan, pink and green pastel colored icing, and decorative designs. The cassata is topped with candied fruit depicting cherries and slices of citrus fruit characteristic of Sicily. Note: If you don’t like orange peel, use 1 tbsp orange zest and add in some glace or candied fruits, chopped. Slice the sponge into three layers of 1 cm thick slices. Grease and line a 23.5cm spring form cake tin. Cut out two circles the size of the base of the tin from the sponge slices, using the cake tin as a guide. Use 1 circle of sponge as the base of cake tin. Cut the other slices of sponge into strips of 6cm wide. Cover the sides of the cake tin with sponge strips, so that you almost completely line the tin with sponge. In a small heavy based saucepan, over a moderate temperature, dissolve the sugar, orange blossoms water, lemon juice and water. Reduce the heat to low and simmer for 20 minutes or until it resembles a light syrup. Remove the syrup from heat. Leave the syrup to cool for about 15 minutes. Reserve a small amount of syrup for the top of the cake. Using a pastry brush and syrup, moisten the sponge on the base and sides of the tin. Combine the ricotta with the caster sugar, icing sugar and candied orange peel or glace orange, with the help of a fork. Spoon the ricotta filling into the sponge and smoothen over the top. Brush the remaining layer of sponge with the syrup. Lay the sponge, syrup-side down, onto the ricotta. Press the sponge down gently. Place a piece of baking paper on top. Place a plate over the top and weigh down the sponge with tins or a heavy weight. Place the entire cake tin, along with the heavy weights in the fridge for several hours or overnight. Mix the icing sugar into a bowl with milk. Stir well until a smooth and thick white paste or glaze forms. The icing glaze should be slightly thick and very smooth. Remove the cake tin from the fridge. Invert the cake onto a large plate. Pour the icing glaze over the cake, spreading it with a wet spatula to glaze the top and sides. Leave to set for 1 hour in the fridge. Cassata is ready to be decorated. Decorate the cassata with the extra candied fruit, as desired. Cassata is ready to be served. Note: The cassata is best eaten within 2 days.